Trump Company Reportedly Looking To Add Another Hotel In Washington, D.C. : The Two-Way Ethics experts often criticize the Trump Organization for running a hotel just blocks from the White House. Now, the company might be looking to add a second hotel in the nation's capital. The Trump International Hotel in downtown Washington, D.C., opened in fall 2016. The Trump International Hotel in Washington, D.C., has generated plenty of controversy since it opened last fall. But concerns about President Trump's conflicts of interest might not be enough to stop his company from opening a second hotel in the nation's capital. The Washington Post says executives with The Trump Organization are scouring D.C. neighborhoods. They are reportedly planning to open a Scion Hotel, which is a more modest, lower-priced hotel chain than the Trump luxury hotels. The Post says the goal is to convert an existing medium-sized hotel in or near Washington's downtown area. In a statement sent to NPR, Trump Hotels CEO Eric Danziger said the company is "exploring many markets as opportunities for our new Scion hotel brand." He said the company doesn't discuss hotel projects that have not been finalized, but "to date, we have over 30 signed Letters of Intent for the Scion hotel brand." Earlier this year, Danziger revealed plans for dramatically expanding the Trump hotel business. He said the company is looking to triple its luxury properties across the United States and to expand the more affordable Scion hotels. The existing five-star Trump International Hotel, just blocks from the White House, has been a lightning rod for critics of the president's decision not to divest himself from his business interests. 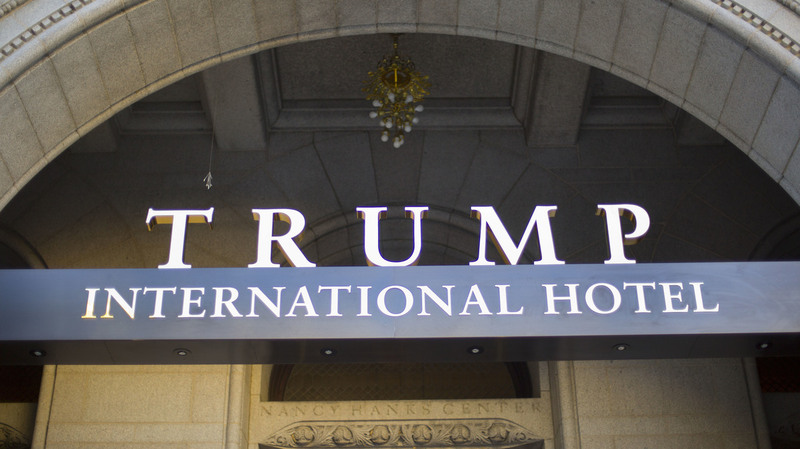 Many ethics experts say special interest groups, lobbyists and foreign governments could use the hotel to try to curry favor with the president. Trump has moved his businesses into a revocable trust and turned management over to his two oldest sons, but the president continues to be the sole beneficiary of the trust. Earlier this month, Diane Gross and Khalid Pitts, owners of the Cork Wine Bar in Washington, sued the president and his company, saying they are unfairly losing business to the Trump hotel restaurant. "We feel that the president of the United States, owning a hotel, owning restaurants, promoting those restaurants, is unfair and to the detriment of other businesses in the city," Pitts said. Ethics experts also have questioned whether the Trump Organization should be allowed to own even one hotel in Washington because of language in its lease. Trump International Hotel operates inside of a government-owned building, the historic Old Post Office building. A provision in the 60-year lease, signed in 2013, specifically states that the hotel cannot be run by an "elected official of the Government of the United States." But just last week, the General Services Administration said in a letter that the Trump Organization is in "full compliance" with the lease because the asset has been moved to the Trump revocable trust. Reps. Elijah Cummings and Peter DeFazio, top Democrats on the House Oversight and the House Transportation and Infrastructure committees, respectively, condemned the GSA conclusion. "This new interpretation renders this lease provision completely meaningless," they said in a statement.